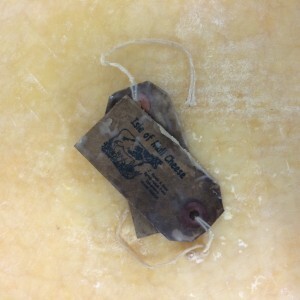 There is only one dairy on the Isle of Mull, and it makes the well renowned Isle of Mull Cheese. We had to make an unplanned trip to Tobermory yesterday on account of an important piece of forgotten homework and a distressed phone call, so we made the most of it. Farmer hadn’t been off the farm for nearly a month, so was surprised to see the changes (!) that had taken place in that time. The Tobermory Hotel had changed colour, a new house had seemingly appeared out of nowhere on the outskirts of Tobermory, and the larches had come out along the road between Calgary and Penmore! The ‘cheese farm’ is located on the edge of Tobermory, and we had to go there to pick up our monthly order of small waxed rounds. I loved the stack of cheeses against the wall in the packing room, waiting to be packed into boxes and sent off to different parts of the world. The dairy used to supply the island with milk, and when we first came to live at Treshnish we enjoyed a home delivery of island milk three times a week. About 10 years ago they stopped selling milk, in order to have more milk to make into their delicious cheeses. The farm is called Sgriob-ruadh, and they welcome visitors to look around the cheese production, and stop in at their pretty Garden Barn for tea and home baking afterwards. 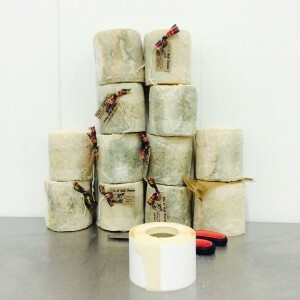 Isle of Mull cheese wins international prizes and is stocked all over the UK in discerning cheese shops including Neal’s Yard, and available online from the Isle of Mull cheese farm itself. I have sent it as Christmas presents before now, and it makes a great change from chocolates! We also picked up our monthly order of organic Island Bakery biscuits – made by another branch of the same resourceful family across the road from the farm!